With so Many ICOs, Which Should Traders Invest In? An ICO should be built on a successful business model with experienced individuals running the project. Initial Coin Offerings (ICOs) are all the rage, with upwards of twenty percent of currency traders already investing in such crowd funding options. Roughly ten percent of these individuals are also planning on selecting new projects for investment, suggesting a large area of growth for ICOs. The most logical options for market participants are of course the ICO of those companies that already create financial products. As a result of this surging demand, trading platforms and sites have been aggressively kick-starting projects in a bid to attract traders and brokers to their respective platforms. Among a multitude of these projects, Genesis Vision has been of particular note, reinforced by a lengthy background of experience in the financial software realm. Unfortunately, short-term thinking plagues many ICOs or hastily assembled business plans. However, with over a decade of experience between Genesis Visions’ founders, potential ICO investors are insulated by a tangible model and proven framework that is seemingly absent in other projects. Genesis Vision is a platform for private trust management, which consolidates exchanges, traders, and investors by creating a singular space where all the trades are transparent and secure for each side. Indeed, for many years, brokers and developers have been trying to market trust management solutions. Some of them, such as PAMM or LAMM accounts, have even gained some recognition among managers. However, so far none of these products has been able to deal with the most important problem – building trust of the sides to each other. Investors have never come to trust managers, suspecting them of dishonest trades, nonexistent statements, and made-up diagrams. By extension, managing traders still distrust brokers, believing that they manipulate prices and generally get in the way of managers’ earnings. Brokers suspect traders of foul play and love of bonuses. Genesis Vision seeks to help bridge this apparent disparity, helping every participant of the system obtain a complex solution for their respective problems: Traders can become managers and attract working assets from investors to scale up their strategies and enhance their income. The fixation of trades through blockchain technology provides managers with a working tool, which can help them, show their competency, and display the actual results of their work. Investors in term garner access to successful strategies, and more importantly, to completely transparent data on what happens to their money, what fees are paid, and what trades are closed. Thanks to blockchain and the use of smart contracts, all the operations are recorded, and thus, the work of the manager is under control. Brokers are also able to expand their product line and gain access to new target audiences, which previously avoided working in financial markets because of their closed nature. “The financial market has accumulated a lot of problems, so we searched for a solution that could be adapted to any instruments and platforms. The result is that Genesis Vision can support investment operations and profit distribution, which are about the same in any market. We start the integration with MetaTrader4 and MetaTrader5, platforms that are the most popular with traders. Then we’ll be ready to adapt the solution to any demands,” explained Mr. Kamensky. Many representatives of the industry also share the belief in Genesis Vision’s model and development. The campaign is being supported by authoritative finance and cryptocurrency experts, including Kostantin Gladych (Changelly): Demetrios Zamboglou (Lykke AG), Lars Eriksson (Genova Global Hedge Fund), Roman Nester (Segmento), among others. Ultimately, “The Blockchain breaks down the barriers between market participants, uniting those who have always been on opposite sides of the barricades. We all on the same side now, and our mission is to make this side as comfortable and profitable as it`s possible, and we are ready to help build the future together,” reiterated Mr. Zamboglou. Last month, Genesis Vision achieved a key endorsement from the Financial Commission, an independent organization engaged in resolving disputes in the finance industry. The group certified General Vision’s ICO, with the platform’s token GVT meeting the certification requirements of the ICC committee. Additionally, Jacob Maas of AtoZForex.com has recognized ICO Genesis Vision as the best placement of October. The company already finalized and finished centralized solution, which that is presently utilized by 80 brokers. 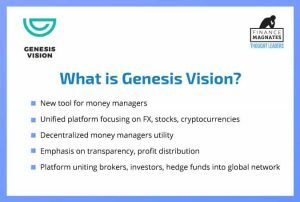 In essence, Genesis Vision’s first clients will be the 400 brokers that already work with the company Tools4brokers whose CEO Alexey Kutsenko is a co-founder of Genesis Vision. The issue of the alpha version of the platform is scheduled for the Q1 2018. Individuals interested in the project can lean more by accessing the following link.